Anyhow, what I like about this flat iron is that it gets super hot, heats up quickly, beeps to say it's ready (this is really useful), the casing stays comfortable to the touch, it doesn't catch my hair, and it works incredibly well. I go over my hair once or twice, not 6-8 times. That alone was worth huge expense compared to the ones I'd used before. I also love the cute case and the heat protector, which lets me leave the iron on the bathroom counter after use without having it hang over the sink edge. The included hair clips were a nice bonus as well, which make it easier to keep sections of hair out of the way while working on the under-layers. I can't believe I own this flat iron. Seriously, I don't normally want expensive things and my husband normally wouldn't go for spending a ton of money on a hair appliance but he agreed with me, it's worth it! 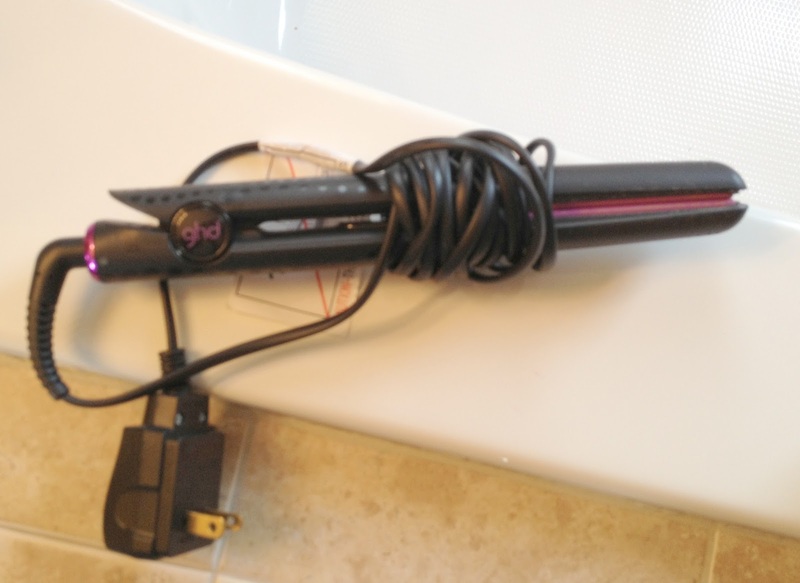 To give you an idea of what this flat iron does, I've put an example above. My hair when completely left to its own devices is a bit like Janis Joplin. If I round brush it with a blow dryer, it's fairly straight but HUGE. I left a small section un-ironed to take this picture so you can see how well my hair straightens (and see how shiny it gets! ), but also I'm amazed at how much longer my hair is straight vs wavy. Insane. Before ironing, my hair looks like a damaged, frizzy mess. After ironing, I look fresh from the salon. Most irons couldn't get my hair this smooth and straight but the GHD does.